The Convocation Awards Ceremony held on 18th of August 2017 was a celebration showcasing the year's winners of Convocation awards, prizes and scholarships. 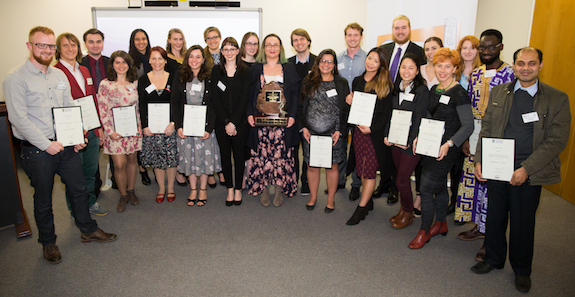 The eighteen Postgraduate Research Travel Awards and Bryant Stokes Matilda Award for Cultural Excellence were presented. For the first time the female and male Convocation Sports Scholarship and Convocation Accommodation Scholarship winners were acknowledged and presented certificates at the Convocation Awards Ceremony. Professor Kent Anderson, Deputy Vice-Chancellor Community and Engagement, professed three times, “I love Convocation” likening Convocation to the UWA tribe. Professor Anderson emphasised that Convocation is important and that it celebrates a lasting connection to a place and to the exploration of ideas. In the last five years Convocation has contributed and facilitated awards and scholarships valued in excess of $250,000. It is the contribution and giving back of the Convocation members (the graduates of UWA), that assists with the awards, scholarships and prizes. These awards, scholarships and prizes celebrate achievement and excellence, so emphasising the research culture at UWA. Some Convocation awards are generously supplemented by other donors such as Professor Bryant Stokes, UWA Sports, the Graduate Research School and the Postgraduate Students' Association. Ms Karen Paiva Henrique from the School of Earth and Environment, Geography, and recipient of the 2016 Geoffrey Kennedy Postgraduate Research Travel Award, spoke of her experiences and discoveries from using her award to spend five months in Sao Paulo, Brazil. Her research, communications with different stakeholders, and observations brought to light other issues impinging on climate change in the area. Convocation also recognises the importance and the efforts of volunteers. On the 18th of August 2017, a new Convocation Outstanding Student Volunteer Award was announced and the inaugural winner, Hannah Morgaine was presented with a Convocation certificate . At the upcoming Convocation Spring Ordinary meeting she will be presented with a Convocation medal.